Last weekend, we had temperatures reach above 60 degrees. The sun, fresh air, and kids’ smiles were incredible! We moved into our new home the day before Christmas Eve and have not really had a chance to explore the outside. We took advantage and instead of driving to a playdate, we were able to walk! We are so blessed to have friends that live nearby. Our stroller holds two and Max was such a trooper walking with me; he even helped me push! After a little more practice, I may even let him try biking on our walks! We know it is not quite spring yet, but this preview was enough to get us thinking (and dreaming!) of the warm days to come! We welcomed our son, Bowen Timothy, on November 5, 2015. He weighed in at 7 pounds 15 ounces, measured 21 inches long, and made his debut at 7:44pm. We are so in love with our newest addition! On Wednesday the 4th, at about 3 in the morning, I woke up feeling regular contractions. I was excited at this point, knowing that my little guy was on his way! Bo’s birth was to be different from my prior birth experiences because I was hoping and praying for a successful VBA2C (Vaginal Birth after two Cesareans). As soon as I felt it was a reasonable time to contact people, around 7am, I let my mom know that she may need to come get Max and Gwenyth because it could be go time. She arrived and Jason and I headed to the hospital around 11am. My contractions were only about 10 minutes apart, but with this being my first attempt at a VBAC, they wanted me to go ahead and get to the hospital. Upon arrival, I was barely dilated. The nurse had us walk around for two hours. Contractions continued to be about 10 minutes apart but became more intense. To much (Much, much, much) dismay, the walk did not improve anything. We were sent home and told to come back when the contractions were closer together. The contractions never got closer together. They stayed 10 minutes apart but did become more intense than I had ever considered. I did not sleep at all that night and in the morning was desperate for some relief. We called in and they told us that we could come back in if we wanted to be checked again. We went in and my thoughts were that I just had to get this pain managed somehow. Well, to my surprise and delight (ha) I was dilated to a 4 and the nurse said they would admit me and break my water! I cried happy tears because I was just sure I was going to get sent home again. I received my epidural, they broke my water, and I actually was able to take a nap. We had great nurses and after a nurse checked me (at a 5) she hung around and chatted with Jason and I for about 20 minutes. Right after she left the room, I felt intense pressure and told Jason he needed to go grab her, something was happening! Since my last check (about 30 minutes prior) I had gone from a 5 to a 9. It was go time! All three of my birth experiences have been incredibly different. (A planned C-section that came a week early, a C-section where I had to be put under, and a VBA2C.) All three have had their good points and bad. 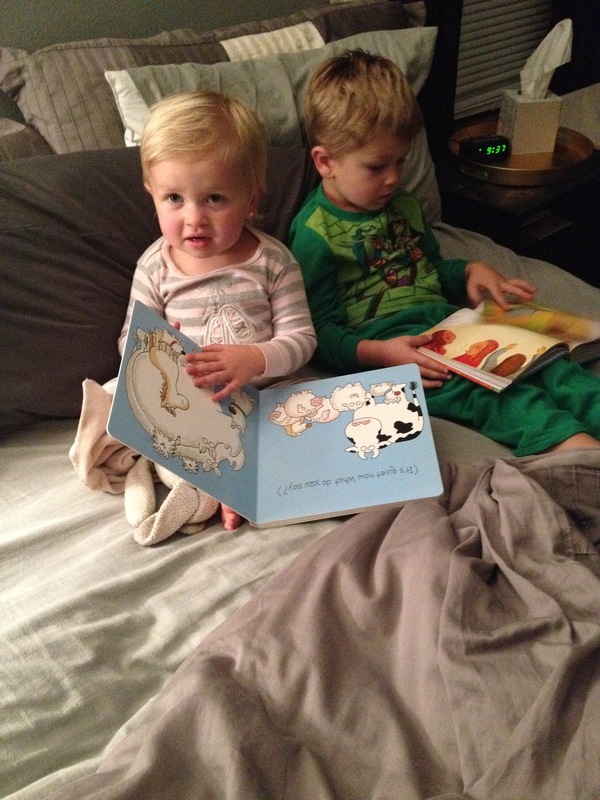 But each one has resulted in a healthy, beautiful baby and I am ever so thankful! We have really been enjoying the cooler weather and are thankful for all the fun activities that this season brings along! One of the highlights has been a trip to Center Grove Apple Orchard with some friends. We went on a beautiful day and got to enjoy all the orchard has to offer; the corn pool, pedal tractors, the gigantic slide, jumping pillow, amazing donuts, and a tractor ride around the whole orchard! So much fun! Here are some pictures from our fall so far! The kids really enjoyed seeing how far they could throw the rocks in! I love these photo ops! Max checking out the goats at the orchard. So cute! Dancing away at our friends’ reception. My sweet gal and I went on a mini date. Gwenyth’s love for babies has not faded one bit. 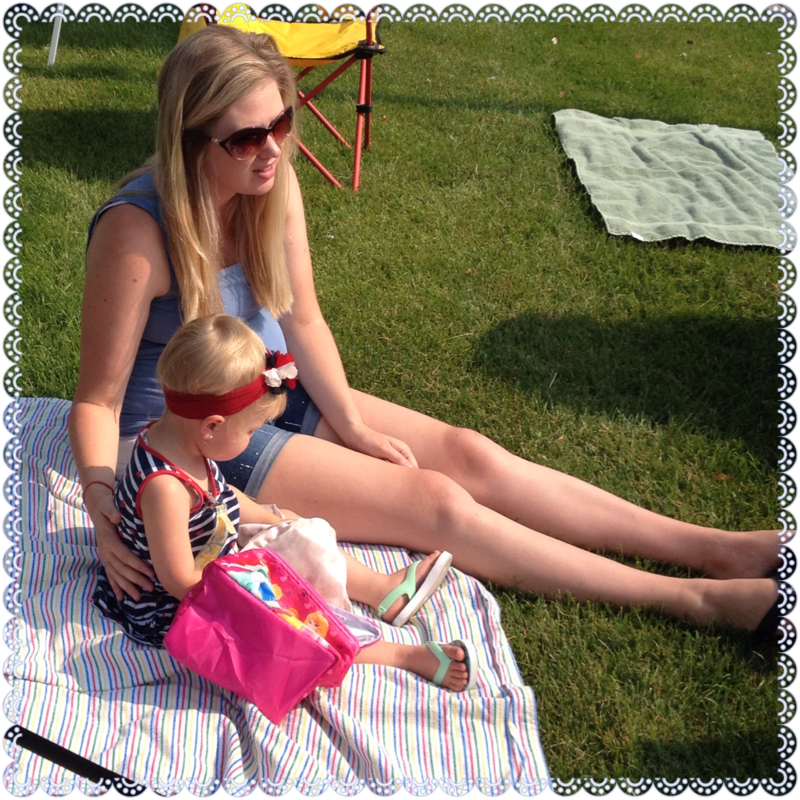 She has started to bring her baby with her on many of our outings. 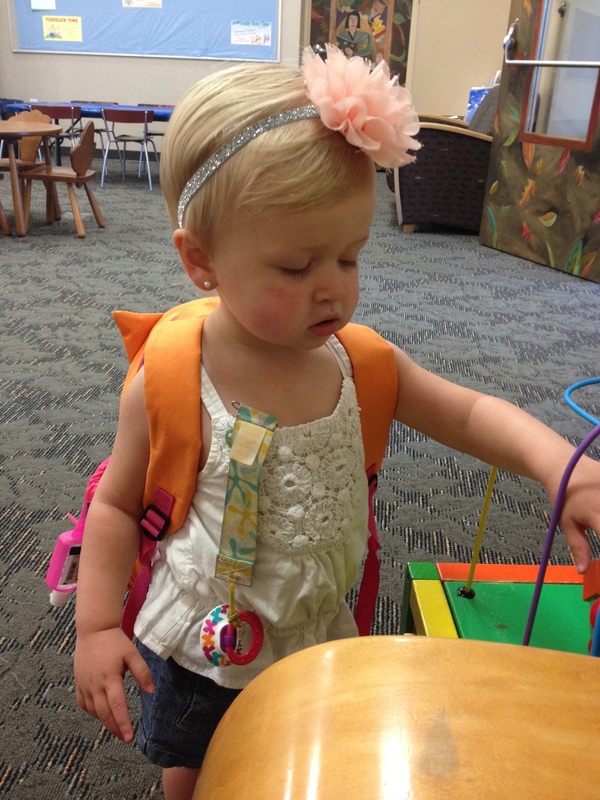 Today is the first day of school for many families we know, and so it seems that summer has kind of come to a close. Another hint is the fantastic cooler weather we have had for the past week or so. We are not ready to put away our swimsuits quite yet, but I thought it might be a good time for a recap of some of our summer highlights! During the last week of July, our family joined up with the rest of the Rude family in Branson for our annual Rude Family Vacation. It is always such a great time spent with family, both immediate and extended. 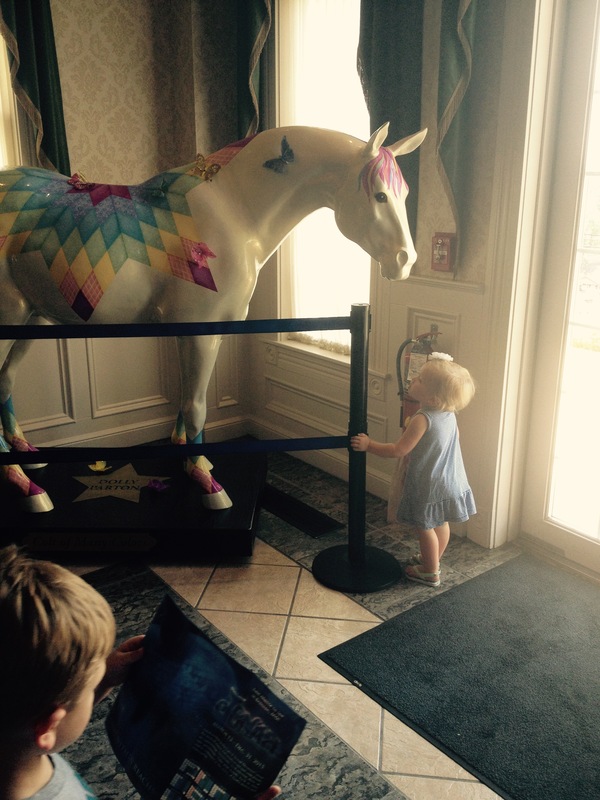 Gwenyth, checking out Dolly Parton’s horse at the Dixie Stampede. 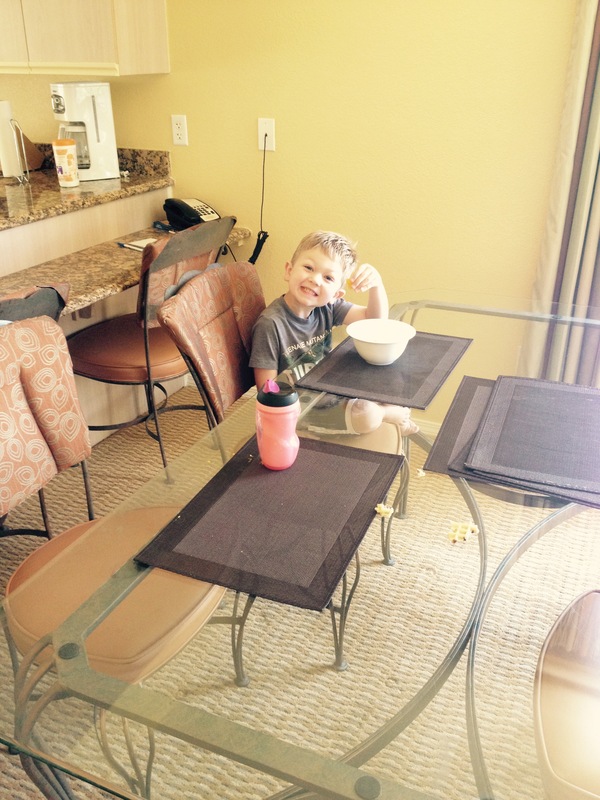 Max, enjoying a snack in our “vacation house” as the kids liked to call it. 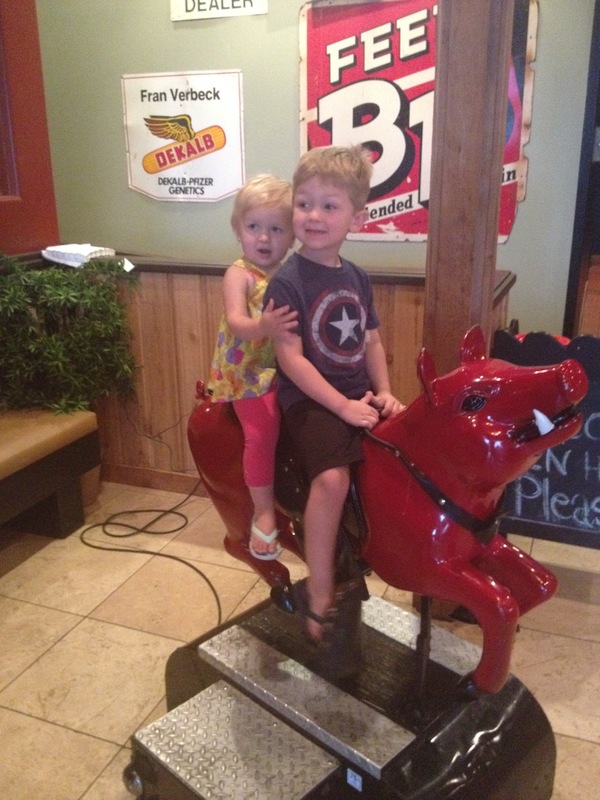 The cuties riding a mechanical pig. Why not? 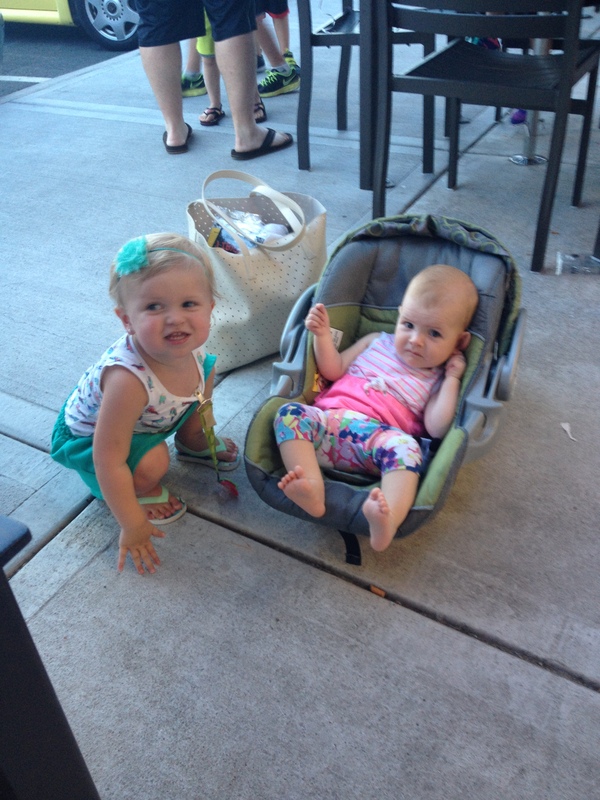 Gwenyth loves her cousin, Karis! 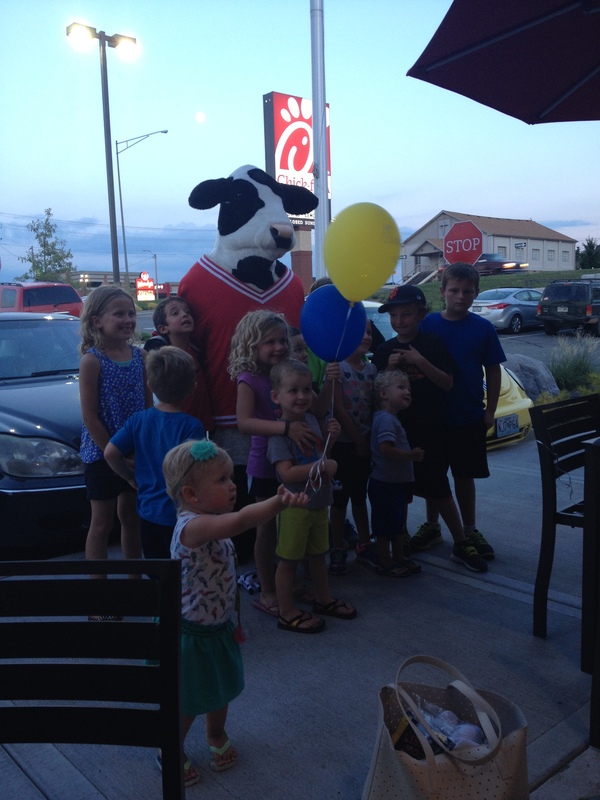 We all gathered at Chick Fil A to celebrate James’ birthday! It was so fun! 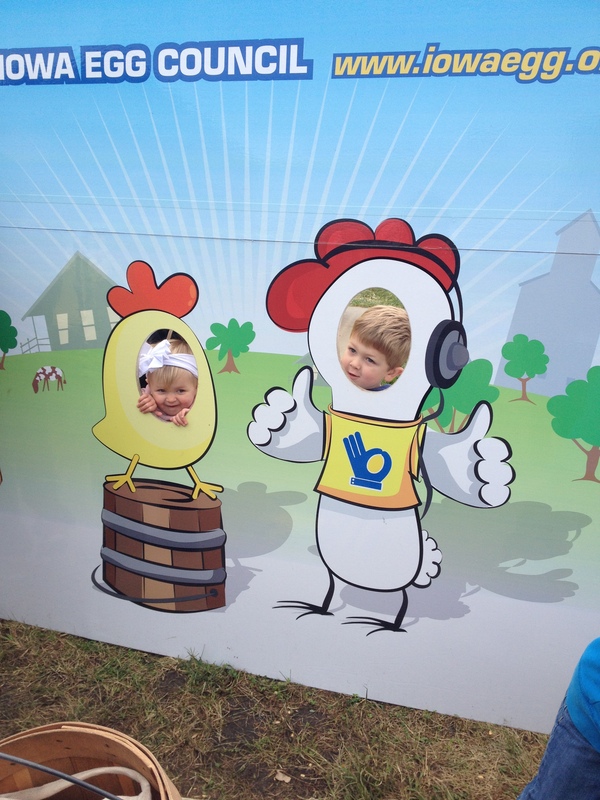 Another fun thing we got to do just recently was visit the Iowa State Fair with my sister and her two kids. We went on a day when the high temperature did not even reach 70 degrees. This pregnant mom did not mind that one bit! 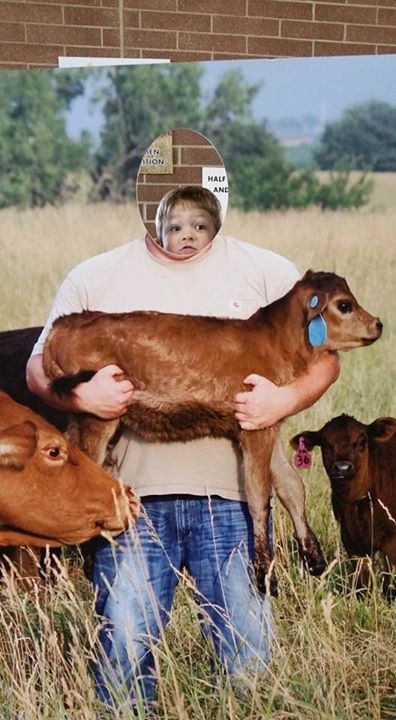 My sister captured this moment of Max with a cow. Too funny! Gwenyth is an animal lover to the core. 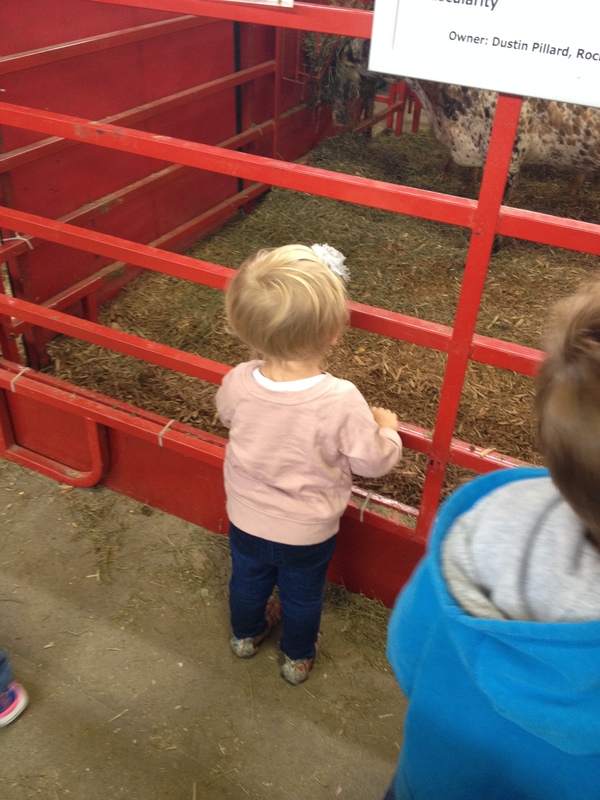 She loved seeing all the animals, I think the baby pigs were her favorite. 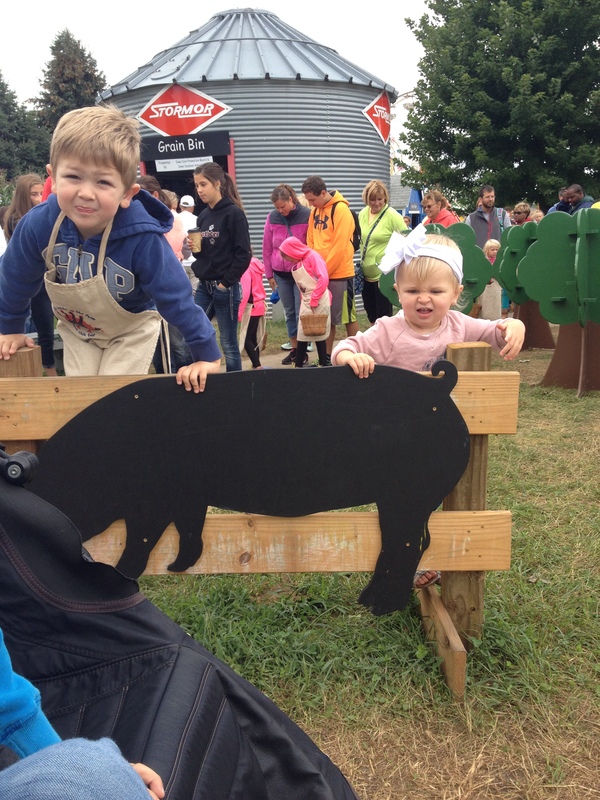 They had fun participating in the little farm set up. They followed a path doing various things that farmers do and at the end they were rewarded with $1 they could then exchange for a real treat! 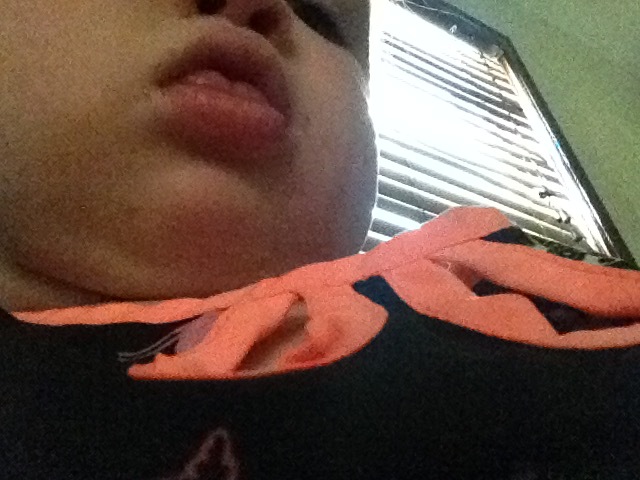 This last picture is just a first in a new series I would like to call “When Selfies Go Bad.” Anyone else find random pictures taken by their kids on their phones? 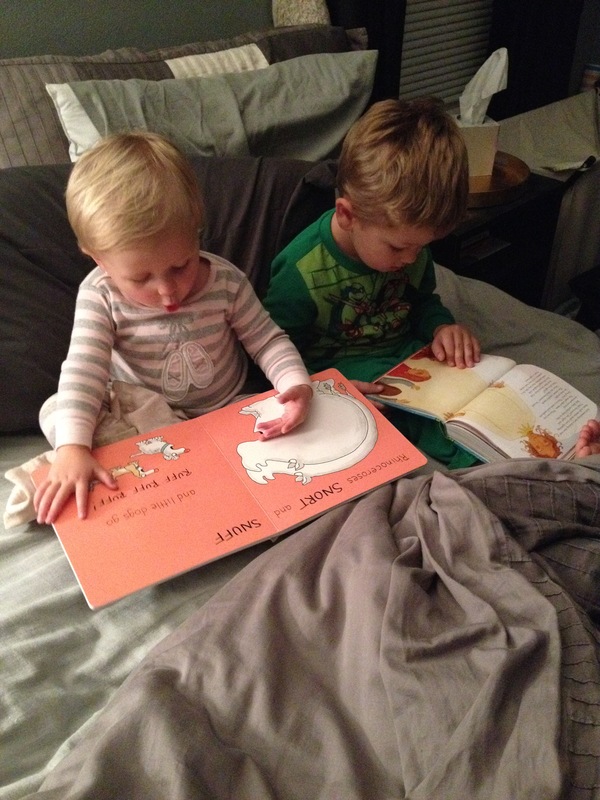 We are having another… BOY! In November, we will be welcoming another bouncing boy into our family! We are so excited! 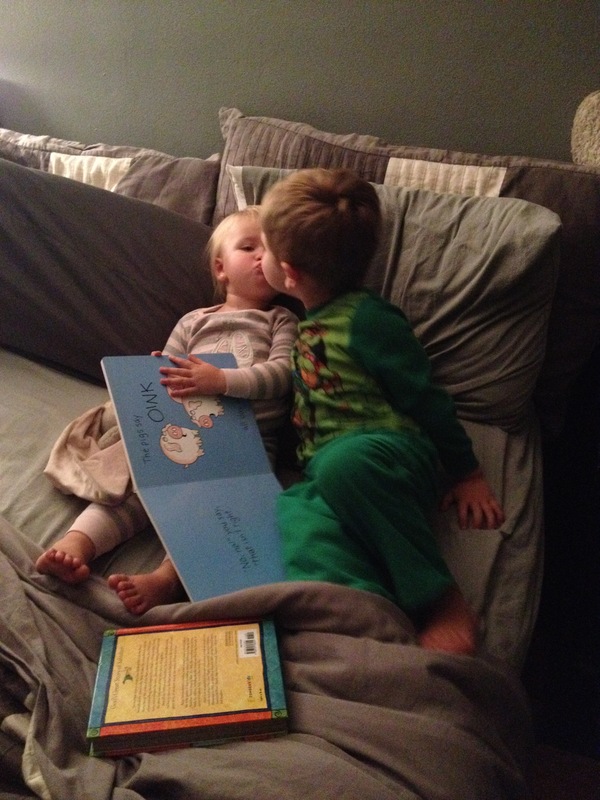 Max is so great, he has begun suggesting names and likes to talk to his brother through my tummy. Gwenyth’s love for babies has not dwindled in the least and we know she will be so happy to finally be able to hold a baby on a daily basis. Summer always seems to go by so fast and it is hard to believe that we are already past the 4th of July. We have kept very busy with many outdoor activities including a few trips to the splash park, bike riding, farm trips, and visits to many local parks. 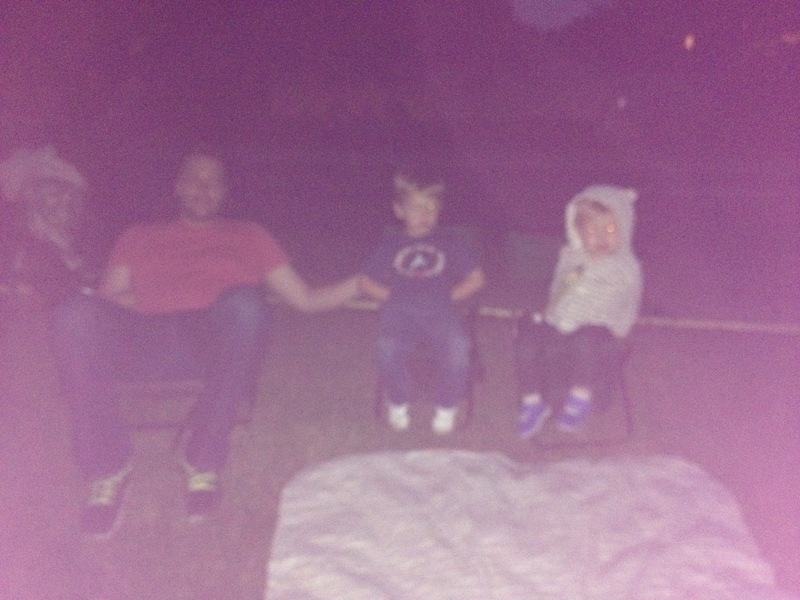 My three loves at the fireworks; blurry but the only one I got! 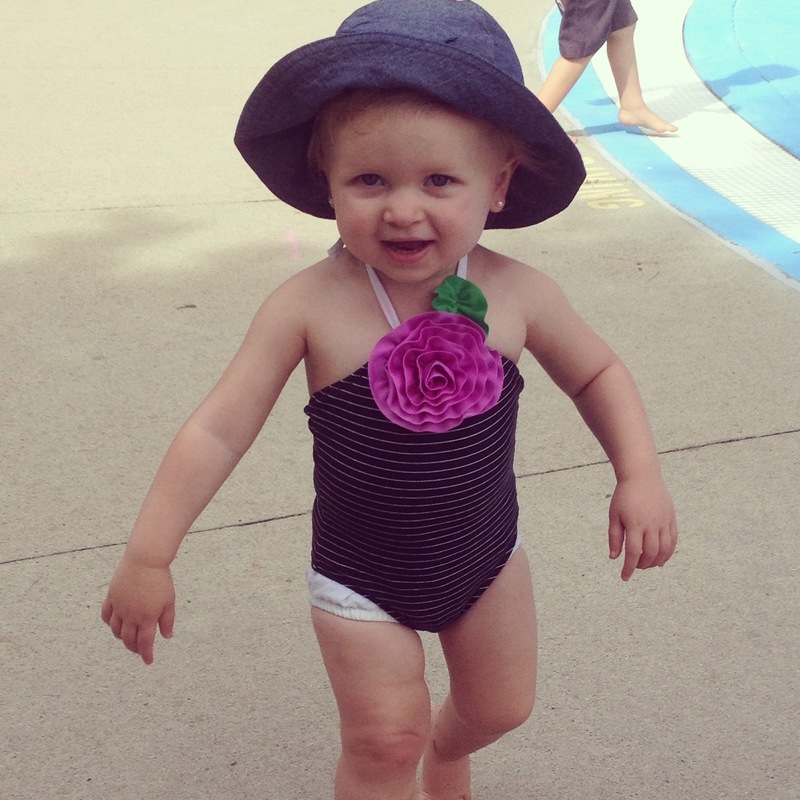 Gwenyth at the splash pad! 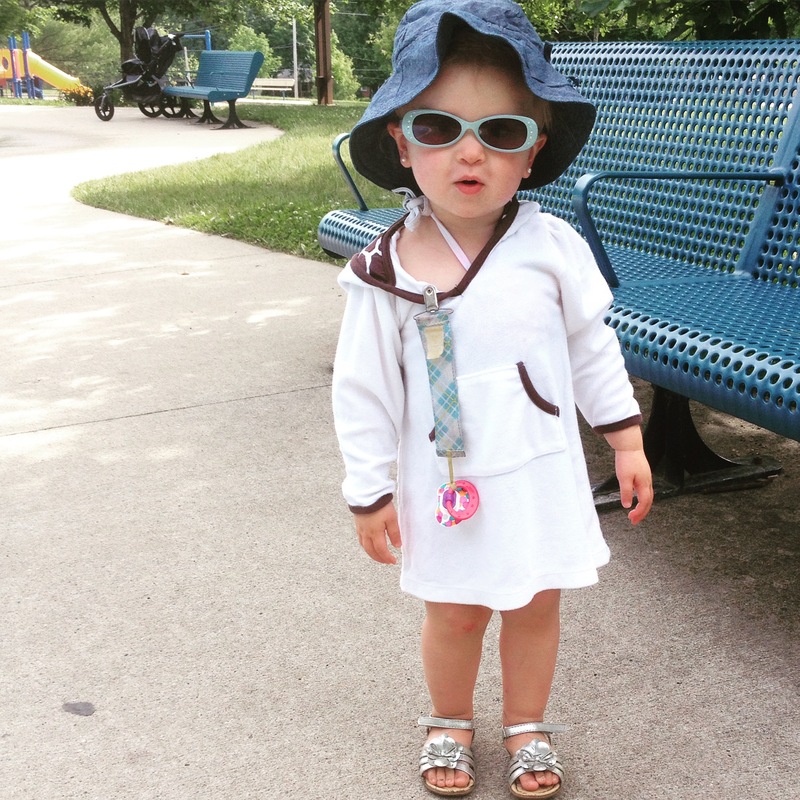 Arriving to the splash pad in style. 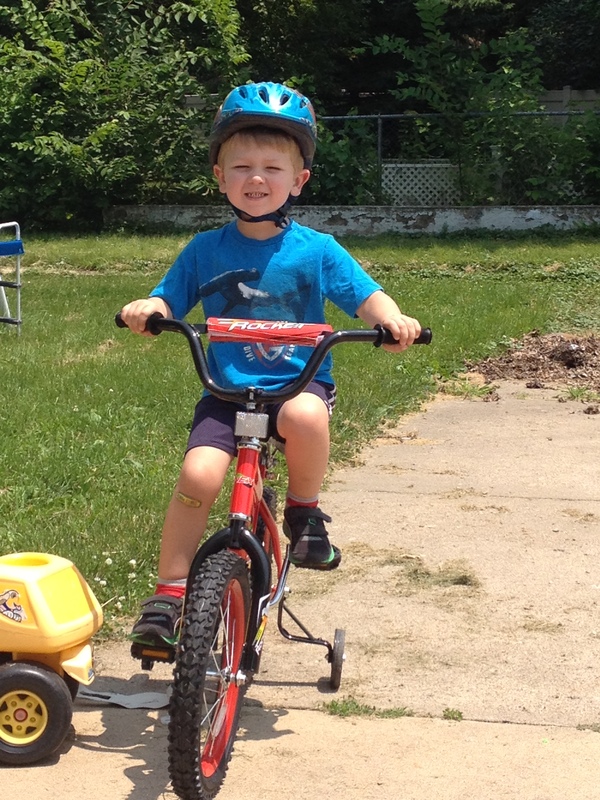 Big boy on a big bike! 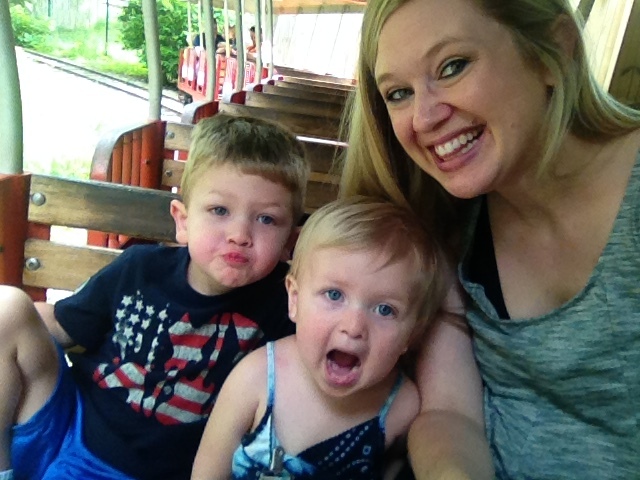 Mommy, Gwenyth, (and baby boy!) at the parade! 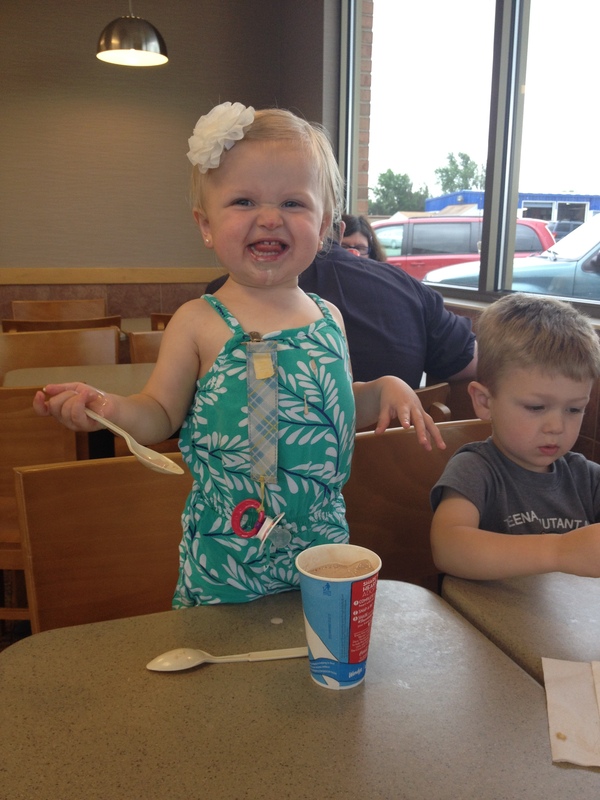 Enjoying a frosty on a summer afternoon. 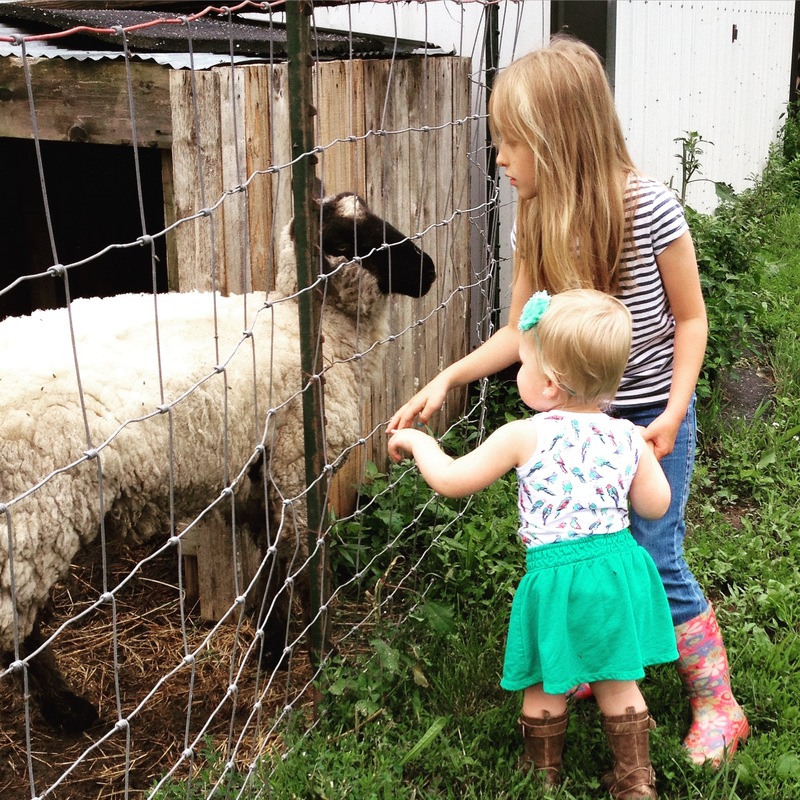 Visiting the animals at Grandma Karen’s. When it gets too hot, you can find us at the library! This year, my hands are very full whenever we visit parks. Max is so great at trying new things and enjoys climbing and jumping. Gwenyth enjoys doing whatever big brother does, so this means I am constantly walking around with my hands up in the air ready to give a boost or catch when needed. Here are the two of them going down some slides. We are looking forward to the rest of what summer brings and then will welcome the fall wholeheartedly as it means we get to meet our new little guy! 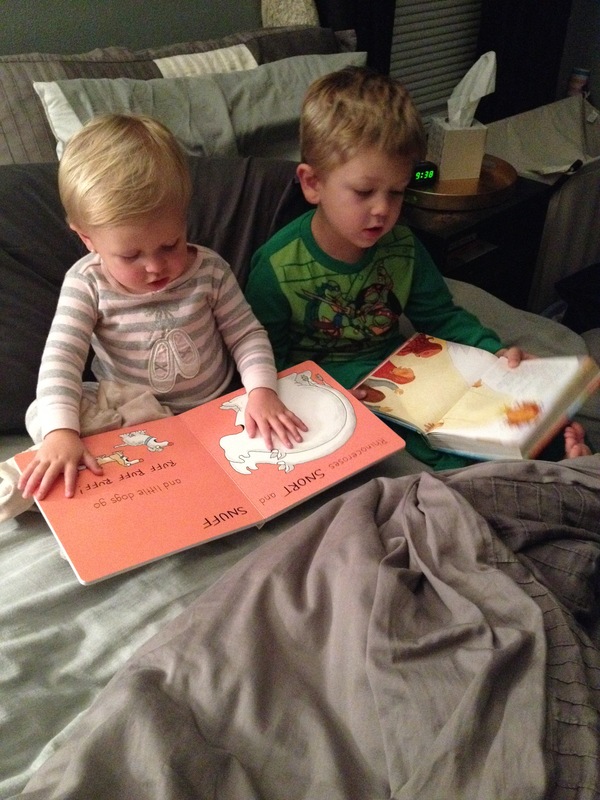 We are so excited to be expecting baby # 3! Baby is due November 14th, very close to older brother’s birthday. What has been so fun about this pregnancy so far is that Max really understands that another child is going to join our family. He was a little too young to fully comprehend things with Gwenyth. Speaking of, Gwenyth, she is super into babies right now. Everywhere we go, she points them out. It is important to note that when Gwenyth mentions a baby, it is actually anyone remotely smaller than her. This is too funny when she wants to hold a “baby” that is maybe an inch shorter, a pound lighter, and has more hair than her. I will have to remember that I won’t be able to leave our new baby rolling around on a floor blanket unattended with older sister nearby! Gwenyth has been told there is a baby in mommy’s tummy, but is a little impatient about when she is going to get to see it! 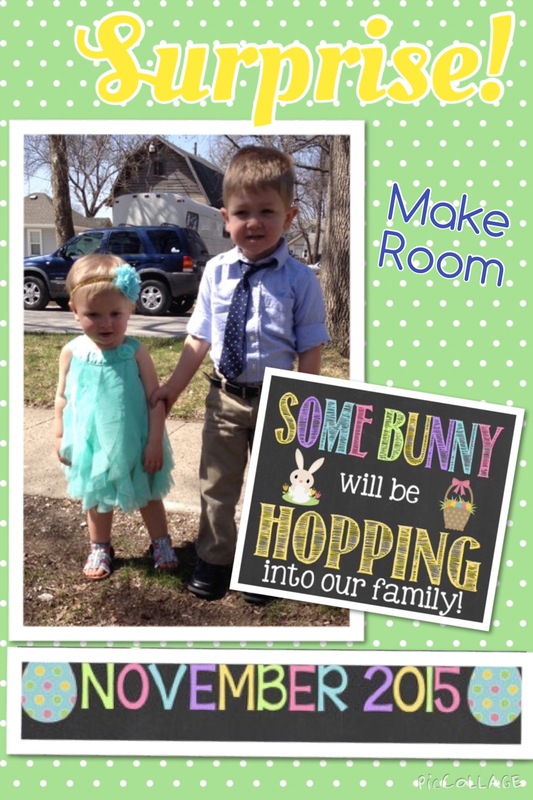 This was the announcement we made the day after Easter! In other news, we are excited about the warmer weather! 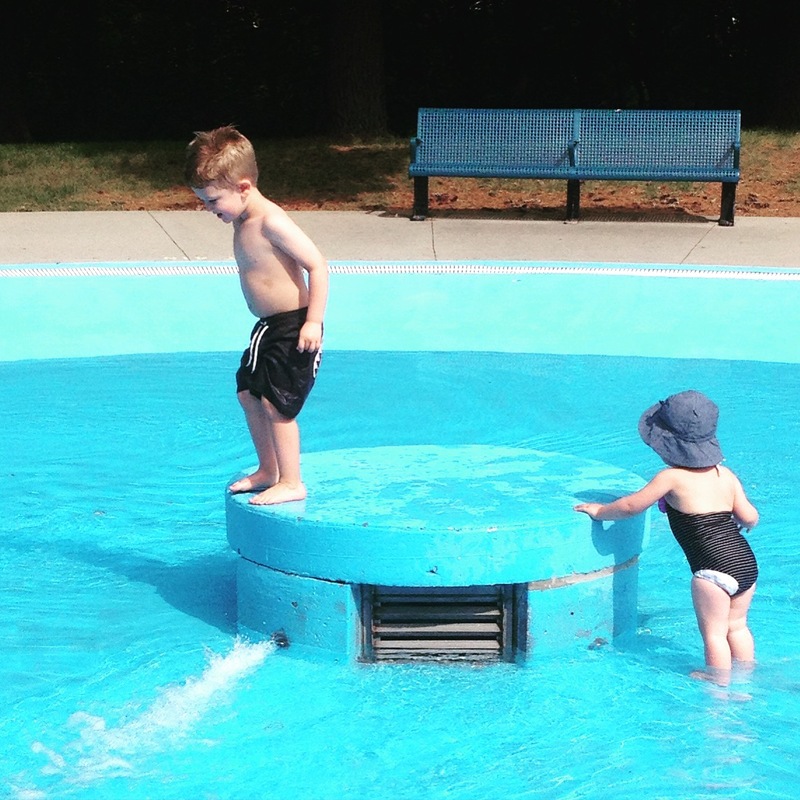 We have had some great days at the park and even got our little pool out! We are looking forward to more outdoor adventures this spring and summer! With friends at the zoo! Cool kids in the car. Feeding the goats at the zoo. Gwenyth kept her distance from the fish. This soup takes very minimal effort for the amazing result! 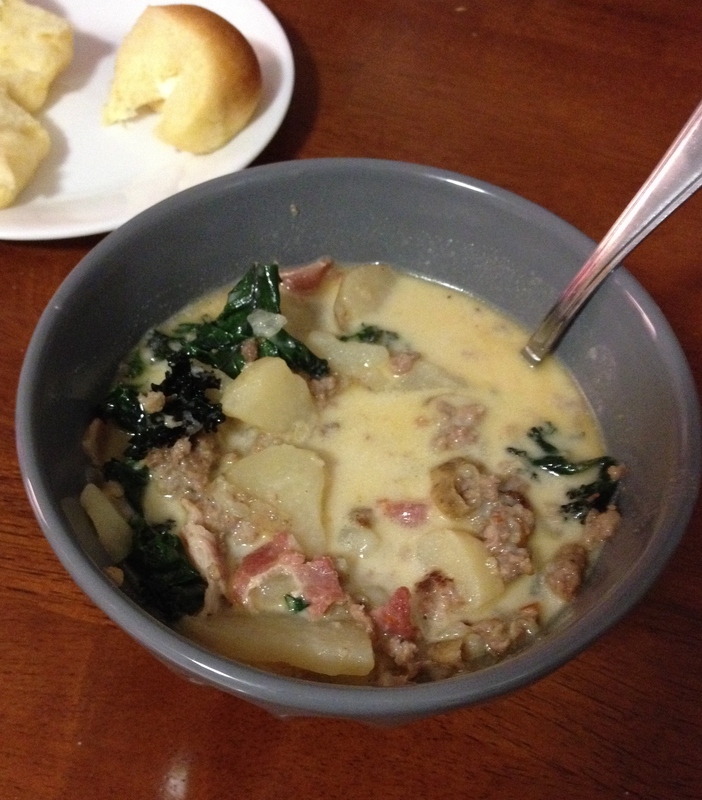 Quickly, this has become one of my husbands favorite and most requested dinners! I typically start out by cooking both the sausage and the bacon. Crumble the sausage in a skillet and cook on medium high heat until cooked through. Drain and set aside. Fry up your bacon using the same skillet, or you could cook your bacon in the oven. While your meat is cooking, combine potatoes, water, chicken broth, onion, and garlic in a large stock pot and cook over medium high heat until potatoes are cooked through. Once the potatoes are cooked through, add the meat, red pepper flakes, salt and pepper. Simmer for 10 minutes. Potatoes should begin to break apart slightly. Turn heat to low and add chopped kale and cream. Heat through and you are ready to serve! We typically enjoy this soup with some fresh baked rolls or crusty French bread!